We all have to eat. And, to be healthy requires that you do it well which can really hit your wallet hard. In fact, according to a September 2015 report by the United States Department of Agriculture (USDA), middle income households spent on average 13.1 percent of their income on food or approximately $5,728 a year. That’s a big chunk of your hard earned pay. Want to reclaim some of those bucks and still dine in style? Then, it’s time to take action. Get the most mileage from your money for household groceries by taking advantage of store and manufacturer sales and coupons. Not sure how to get started? Follow these six couponing tips to become an expert shopper and squeeze the most value from your dollar. Scavenging for Deals – Your hunt begins by searching newspapers, junk mail, and store mailings. Don’t be afraid to ask neighbors and friends to share their discarded inserts. Also be on the lookout for deals in magazines, on store shelves, on products, and on the back of your store receipts. These are referred to as Catalina printouts. Coupons can also be found online. For more ideas, read about the best places to find coupons and visit lists of printable sources and grocery sites. Make it a game and soon you’ll be well on your way to squirreling away lots of wonderful savings. Organizing your Stockpile – Once you’ve gathered your loot, it’s time to get organized. This may require some effort and tweaking to establish a method that works for you. Otherwise, couponing can become extremely frustrating. Decide if you want to clip out all of the coupons in your inserts or just snip them when you need them. Then, develop your own filing system based on this guide. Use a binder, coupon wallet, recipe box or shoebox to keep all of your clippings in one place. File them by categories such as frozen foods, canned goods, breakfast, dairy or whatever makes sense to you. You can also sort them by food aisle. Place those with the closest expiration date in the front of a section so you use them first. Also, discard those that are no longer valid. Doubling your Win – Understand doubling and make sure you know which stores do it and their policy. For example, do they limit the number of manufacturer’s coupons they will double? Matching Competitors – Remember to ask if the business accepts a competitor’s coupon. If they do, also include those in your shopping. Timing your Attack – Knowing when to make a purchase based on sales is the best way to score large. Don’t waste your valuable coupons on full-priced items. Add to your savings by combining them with store deals. Going for a Triple Play – You will know you’ve become an expert if you can stack coupons and get a triple play. This occurs when you find a store coupon for a single item, combine it with a store coupon for savings off the total transaction, and then top it with a manufacturer’s coupon for the biggest win possible. Enjoy the rush you get when you do ts. You’ve earned it! These “couponing” tips will help you fill your “fridge” for the least amount of money possible. Never pay top dollar for a product again by taking advantage of sales and stocking up your pantry for the future. 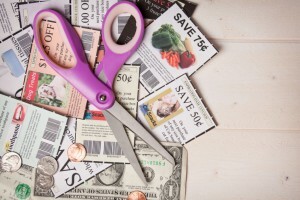 If you’re new to couponing, visit these best stores for beginners. Also, be sure to shop at your commissary. Items there are available at cost plus a 5% surcharge with an average savings of 30% compared to commercial prices. Also, commissaries partner with different companies and manufacturers to offer exclusive savings and they accept manufacturer coupons. Those located outside of the U.S. will even accept expired coupons. Read Omni’s blog—Shop at the Commissary and Save Money—to stretch your food budget even more.